I lose count of my “jobs” these days: my literary writing (that theoretically pays, or had better one day or else), a nonprofit board on which I serve as president, and the magazine I started last year. While I certainly put the same intensity into everything, I can definitely say that I work more hours for free than I do for pay. So when I got the advice from a well-meaning friend, "You shouldn’t let them work you like that for free!" I had to shake my head a little to see his perspective. I’m so committed to these projects (and I know the money simply isn’t there unless I raise it myself) that I don’t mind the work:pay ratio. My general agreement with myself is that as long as I’m making enough money to pay bills, buy good coffee and local meats and veggies, and save a little, I can do whatever I want with my (ahem) "spare" time as long as it’s for a genuinely good cause. I heard the same phrase again a few days later, directed at someone else. "You shouldn’t do that for free." Well, maybe you should do it for free? I honour and pay fealty to your right to maintain your own sets of career principles and your own agreements with yourselves. But I’d like to point out that doing a thing for free might often be in your best interests and, if you have your basic financial bases covered like bills, food, and savings, doing things for free could be good for your financial and your emotional bottom lines. 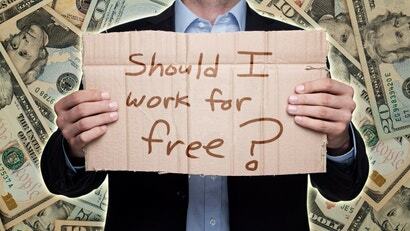 Actually, there are many times doing a thing for free could be... well, profitable. A lot of academic and nonprofit work ends up this way. At many local writing and creative non-profits, volunteers hobnob with established writers and artists whose reputations are truly luminous by taking them out for drinks, designing newsletters, or staffing events where you may not be paid for the drink you just handed to Tom Brokaw. But come on — Tom Brokaw! It’s the “layer” of superstars just under the Tom Brokaw level who can potentially be the most helpful to your career and to whom you wouldn’t have access if you were doing similar work for pay (say, as a cocktail waitress or caterer or managing the customer newsletter for a small business). These are the people who will be the "who" in the old famous phrase, "it’s not what you know, it’s who you know." As the representative of the nonprofit on whose board I serve (and which has me up late many nights working for free), I took it upon myself at a small writers conference I attended to show a good time to the agent who had been brought in to give us talks on the publishing process. We’re now great friends, and though I have my own agent, I will look to her for advice and connections to her favourite editors. It was free, and it could be the relationship that makes all the difference in my career. A lot of grant writers and public relations professionals begin their careers like this: the PTA or the neighbourhood board or the church outreach group sees an opportunity to apply for a grant. Or a small startup need to get some PR and can’t pay. "I’ve always wanted to learn that," the parent or neighbourhood board member or friend-of-a-startup says. "I’ll try!" A couple of turgid books and dozens or hundreds of hours of free work later, and the grant is submitted or the public is related to. Once you’ve accomplished that and had quantifiable successes, those can be easily translated into for-pay work (and the good kind, that pays handsomely by the hour), and those you’ve helped will be eager to write you references. I run a magazine, and we always need more help. "I would love to have an editorial position on my resume," said one volunteer. While the volunteer's are bountiful, her experience is in other fields; we’re not going to split hairs and we happily offered up a title that gave both the gravitas she required and also filled the functional hole we needed filled. While it’s even more work for free, starting your own thing is another way to get a title for which you may not be able to be hired. A small nonprofit organisation you started could use an executive director! How about you? Next time you want to apply for a position whose screeners won’t accept anyone without [fill in blank] years of experience in [fill in blank] management, you’ll fill in all the blanks. A board member came to the board with an offer: “I work as executive director free for six months, while I work to raise money for a salary for myself.” Once six months had arrived and the volunteer had raised the requisite money in grants and donations we might never have attempted without him, it was an easy sell. If you’re going this route, it’s good to get the agreements in writing, and even worth hiring a labour attorney to draft a contract with specific benchmarks. "If Jane Jones raises $x thousand in grants and $x thousand in individual donations by December 31, the salary will be $y effective January 1." If you can afford to work for free, and you’re slaving away for some tiny nonprofit staffed by homeless youth, and there is no future in this work, and you’re far too old to get any sort of “community service” credit for this, and all you’re doing is washing dishes but you are having amazing conversations with the people you serve and you feel you’re making a difference in the world? GO FOR IT. Be prepared to look your well-meaning advisers in the eyes when you complain about your wrinkled hands or the stinky neighbourhood where you work, when they say "You shouldn’t work for free." You can say "Thanks for caring about me," and show up again tomorrow because you are awesome and the world needs more people like you. Sarah Gilbert is a blogger by trade and a finance geek at heart. She cut her teeth on her first Excel spreadsheet full of financials at the tender age of 21, when she began her investment banking career in First Union’s Loan Syndications group. She went on to get her MBA from Wharton, work at Merrill Lynch, and fall in love with analysing company strategy and endless rows of numbers. She got into blogging as a marketing strategy; the blogging took. She now is a freelance financial and (award-winning!) literary writer, working in between baking bread and finding socks for her three little boys in her beloved 1912 Portland, Oregon, home. Sarah's even-more-personal blogging about being an Army wife, parenting, food, biking and life can be found at urbanMamas and Cafe Mama. Follow Sarah Gilbert on Google Plus.